It’s the season when we decorate our places to be jolly and to celebrate – the depth of winter, the Virgin Birth, the elemental gods or just excess. Decorations can be symbolic, tasteful, kitsch or crass, but the tendency seems to be towards the latter. Advances in materials and electronic technology give us a dazzling variety of decorative opportunities, and yet it is their convenience and cheapness that is reflected in the windows of shops and homes, across the UK at least. 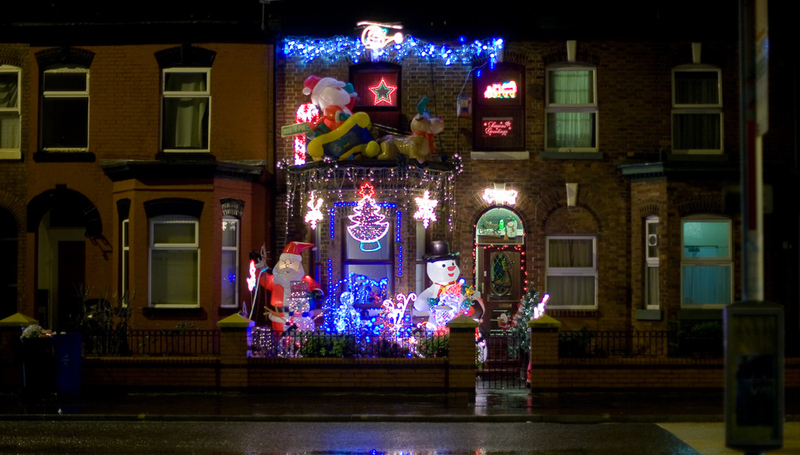 Before I’m accused of humbug, I love the over-the-topism of houses and businesses that cover every inch with lights and plastic santas and reindeers. It’s the effort that counts. A display that reflects thought and effort, whatever the cost, whatever your taste, generally attracts smiles and even applause. If a thousand twinkling lights are now affordable, why do we have to see dreary strings of mean white LEDs, flashing in dull repetition to draw our attention to the lack of imagination and any cheer in their installation? And since when did blue become a festive and seasonal colour? There must be good examples of how we use our places to celebrate the season, and make the most of long hours of darkness. I’d like the Academy to celebrate these, and encourage everyone to put thought and effort into their public, and perhaps even their private displays. Over the Christmas/Yuletide period please capture the ones that you feel demonstrate the spirit of the season. Good taste not a necessary criterion. We’ll find a way of celebrating them, and encouraging others to make the effort to be jolly! Our End of Year Review was lively, thanks to a good mix of established and new Academicians, and some Young Urbanists too. We gave the Awards process a thorough airing, resulting in several suggestions for increasing the relevance and profile of the Awards, and strengthening the rigour of selecting and voting for candidate places. We also agreed to focus in the coming year on suburbs and seasides as timely `learning from’ opportunities, and we’ll be exploring these topics through local and other events in the coming year. David Rudlin AoU presented the persuasive logic of URBED’s winning submission for the Wolfson Economic Prize with wit and wisdom. He stimulated lively discussion with informed contributions from various perspectives. I think there was close to consensus by the end of the review that if we are to achieve the homes we need in the places we deserve, there has to be a fundamental break with the status quo. Trying to force current structures and systems to overcome the problems for which they are at least partly responsible isn’t going to work. Suitably inspired and enthused, we gathered in the increasing glow of the drinks reception generously provided, once again, by Alan Baxter AoU. Alan’s continuing support for the Academy, along with many other organisations under his roof, is a huge contribution to the promotion and appreciation of great places, and we are ever grateful. I hope your Yuletide is happy and peaceful, and look forward to welcoming even more of you to Academy events in the New Year. Don’t forget those images of great decorations!